BETHPAGE, N.Y., Nov. 10, 2009 -- Northrop Grumman Corporation (NYSE:NOC) employees, who spend their workdays designing some of the most advanced weaponry for our Sailors, Soldiers, Marines and Airmen, gave their Saturday, Nov. 7, to serving our men and women in uniform in other ways. In the morning, over 150 employees and family members teamed up at the company's facility here to pack toiletries, games, snacks phone cards and other items into gift packages for service members worldwide as part of their second annual USO Care Package Stuffing Party. That night, Northrop Grumman hosted over 100 local servicemen and women and some 400 employees and family members at Long Island's Nassau Coliseum for the New York Islanders and the USO at Military Appreciation Night. For the Care Package program this year, Northrop Grumman donated the 10,000 prepaid phone cards that GIs can use to call home. As last year, the team also included cards with messages of support written by company employees, their families, and others. In 2008, the team had assembled 11,000 Care Packages. 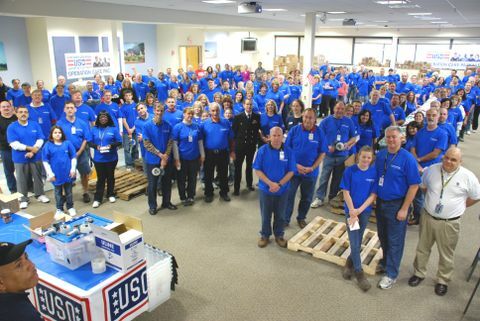 On Saturday they exhausted the USO's supply of items, assembling 10,051 in about three hours. "Our USO Operation Care Package stuffing party in Bethpage and sponsorship of the NY Islanders military appreciation night are just two of the ways that we are honoring our military service men and women for their service to our country," said Patricia McMahon, vice president and deputy general manager, Battle Management and Engagement Systems division. "These great events complement the arrival of the USS New York last Monday, its commissioning on November 7, and our Veteran's Day recognitions on November 11. We can never do enough to support our troops and their families." 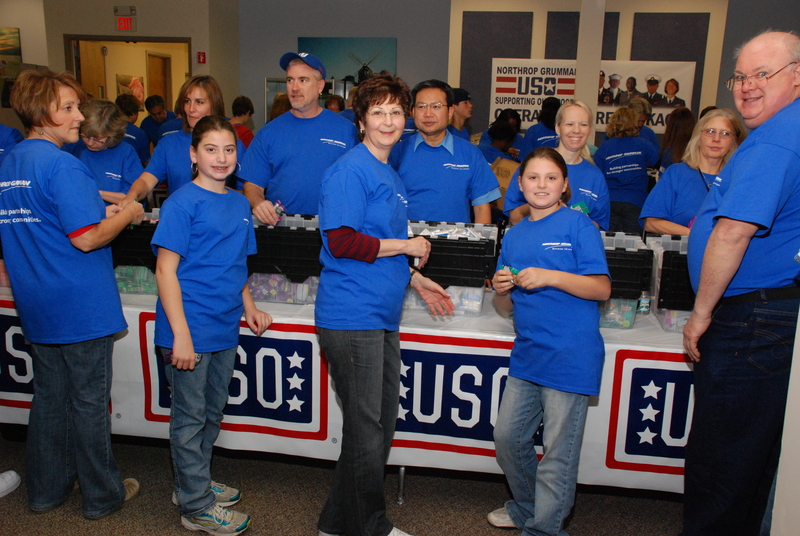 "Once again, Northrop Grumman employees have stepped up to the plate and hit it out of the park," said the USO's Ron Wise, who coordinates these stuffing parties for the organization throughout the United States. "I was honored to be here again with this group. I'm overwhelmed by the energy of these employees and their families." In addition to these fun events, Northrop Grumman has an initiative in place to develop career opportunities for disabled veterans. Called Operation IMPACT (Injured Military Pursuing Assisted Career Transition), it provides transitional support and employment to military people severely injured in the Global War on Terrorism. Operation IMPACT looks beyond finding veterans to fill job openings. The company's Operation IMPACT team investigates potential needs in company programs and helps the programs develop new job opportunities for these veterans. Beyond that, Operation Impact assists the families of injured service people, if the latter are unable to work as a result of the injury. Since 2005, when the company initiated Operation IMPACT, Northrop Grumman has hired 48 veterans and seven primary family wage-earners, with more in the pipeline. Three are working on the Broad Area Maritime Surveillance program in Bethpage.